Individuals who are divorcing in California should be careful to ensure that their courtroom battle does not spill over onto the Internet through blogs and social media websites. Although many people take to Facebook, Twitter, and other websites to discuss their concerns or simply to vent, using the Internet to slam your soon-to-be ex-spouse can backfire. In addition to affecting your family and children, making accusations and insulting your former spouse online can hurt your divorce settlement and even get you sued. A 2010 American Academy of Matrimonial Lawyers survey found that 81 percent of the organization’s family law attorneys saw an increase in the number of divorce and other cases that used social media as evidence between 2005 and 2010. That means everything you say online could potentially be viewed by a judge. In order to protect yourself during what is often a highly emotional time, it is important to keep this in mind whenever you use the worldwide web. In addition to being used as potential evidence against you in a divorce settlement or child custody case, what you say about your former spouse on the Internet could potentially get you sued for libel. Although you are allowed to express opinions about your ex, you may not make untrue statements in a public forum. Additionally, you may not use social media to harass or stalk your former spouse. If your ex is ranting about you online, you should be sure to ask your divorce attorney to talk to your former spouse’s lawyer about the situation. Even if your statements are true, trash talking your former spouse may still come back to haunt you. Saying negative things about your ex can have an effect on his or her current and future job prospects and make it difficult for your former spouse to financially provide for your children. Additionally, a judge may factor social networking complaints and other online evidence into a child custody or alimony award. Although judges in California divorce cases normally do not issue gag orders, it may be a good idea to negotiate terms regarding any online discussion of the one another into your divorce settlement agreement. After a former couple has already headed down the path of complaining about one another online, a simple apology may be all that it takes to return to civility. As long as any accusations did not get too far out of hand, both former spouses can often agree that ending a marriage is a stressful time and lapses in judgment sometimes occur. 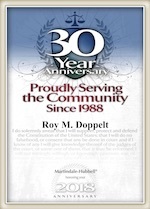 If you have divorce, child custody, or other family law questions, you should contact Doppelt and Forney, APLC today. Mr. Doppelt is a capable Southern California divorce lawyer with more than 20 years of experience guiding clients through the legal separation and divorce process. Mr. Doppelt is available to assist you with all of your divorce, alimony, child custody, child support, adoption, and other family law needs. Doppelt and Forney, APLC represents clients in Scripps Ranch, San Diego, Encinitas, Linda Vista, and throughout Southern California. To schedule a free confidential consultation with a skilled family law attorney, do not hesitate to call Doppelt and Forney, APLC toll-free at (800) ROY IS IT (769-4748) or contact us through the law firm’s website.